(MissionNewswire) Salesian missionaries in Addis Ababa are working on becoming self-sustainable and self-supporting thanks to a new solar power project, funded by the Austrian Development Agency. The project, “13 months of solar power in Ethiopia,” includes the installation of solar panels in many Salesian centers, a train the trainers program in many of the Salesian vocational and technical schools, and a solar energy awareness campaign in schools. The project has provided pamphlets and facilitated national-level symposiums and discussions on the topic of renewable energy. Salesian missionaries have also established solar energy departments in the four Salesian technical schools in Adwa, Mekanissa, Dilla and Gambella. 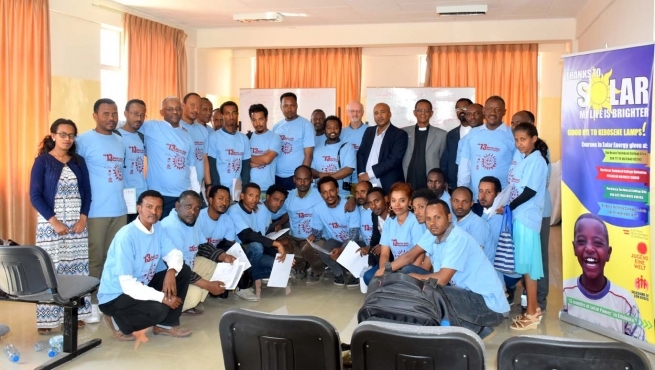 From Jan. 22-Feb. 2., Salesian missionaries held a two-week training program for all the federal technical and vocational teachers in Ethiopia. The training was entirely coordinated by Salesian Brother Christof Baum and two electrical studies teachers from Don Bosco Adwa TVET College. Twenty-seven teachers from a number of regions across the country were in attendance at the training. The program aimed at providing the electrical studies teachers the tools and know-how to teach solar energy technology to their students on their own. It also focused on helping teachers be able to train students on how to start their own businesses and generate income via the installation, repair and maintenance of solar power systems, a sector that is quickly gaining momentum in Ethiopia. The content of the course included topics such as renewable and non-renewable energy, the effects of CO2 on climate change, electrical energy generation in Ethiopia, the electricity situation in Ethiopia’s rural areas and more. The course was highly praised by all participants who thanked Salesian missionaries for taking on the initiative and making it possible. The training is extremely relevant for Ethiopia as a good majority of people still live in rural areas where many lack electricity. Once night falls, people cannot see outside of their homes or navigate in their communities. They often rely on fire and lanterns that generate smoke and cause health-related issues. Now thanks to the project, more people are using small solar lanterns that decrease health concerns. In addition, with solar power installations, people are able to recharge their mobile phone batteries and other gadgets without having to travel to the next larger village to do so.